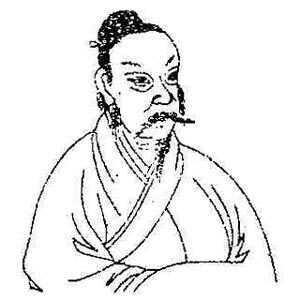 Wang Tong (583 - 616), style name Zhongyan, was later better known by the nickname Wenzhongzi (Wen Zhongzi). A famous writer and Confucian teacher, he was the elder brother of Wang Ji. They were both from Longmen, northeast of Chang'an. As a youth Wang Tong was (see Giles) "such an ardent student that for six years he never took off his clothes." He proposed 12 "Plans to Secure the Empire", and when these were not accepted he retired to He Fen, the area between the Fen and Yellow rivers, about 150 km. northeast of Chang An, there teaching thousands of students. When Yang Su4 made him an offer of official employment, he proudly declined it. After his death his disciples canonized him Wenzhongzi. He is said to have created this; the title can be found in old melody lists, but there is no surviving tablature. Wen Zhongzi had the given name Tong and style name Zhongyan. As a youth he had an ardent desire to help people, and so (in 592 CE) he traveled west to Chang An to see the Sui emperor Wendi (r. 589 - 605) and propose 12 Plans to Secure Tranquility, but they were not able to use them. 21295.1130/2 王通 says 龍門人，字仲淹....門人諡曰文中子 he was from Longmen (in 絳州 Jingzhou district, northeast of Chang'an), style name Zhongyan....his disciples called him Wenzhongzi after he died. It lists a number of writings attributed to him, but says only his 中說 Zhong Shuo survives. He is not in ICTCL or other standard literature sources, but see Giles. Xu Jiang discusses him in Qinshi Chubian Chapter 5a. However, it is quite unlikely that there is truth to his claim that the surviving Ming dynasty tablature for the melody Gujiao Xing reflects a melody created (or even simply played) by Wang Tong. There is a detailed study of Wang Tong in Ding Xiang Warner, Transmitting Authority, Wang Tong (ca. 584–617) and the Zhongshuo in Medieval China’s Manuscript Culture; Brill, 2014 (details). A military leader who helped establish the Sui dynasty (581-618) and was almost as powerful as the emperor himself (Wiki). This is the only composition that is claimed for Wang Tong in all Sui and Tang sources that bear on the Wang Tong question. The comment here that it can be compared to Confucius' Gui Shan is perhaps referring to an old version of the melody attributed to Confucius called Gui Shan Cao. 6. In QQJC V, pp.355 - 358. See also Xu Jian's History, Chapter 5. A. (p.53), Giles, etc. Except the beginning and end, almost all of this can be found in Wang Tong's 文中子中說 Wenzhongzi Zhongshuo (online). Regarding "蕩之什 Dang zhi shi", 蕩 Dang (MIghty) is a poem in the Da Ya section of the Book of Poetry (#255); it is followed by 10 poems with which it is commonly grouped ("Dang zhi shi" might be translated Suite on Might). There are no surviving qin settings of any of them.